The G7 Summit is the annual meeting of the Group of Seven leaders. It's hosted by the G7 president for that year. The summit doesn't have any legal or political authority. But when these seven world leaders agree on something, it has the power to shift the direction of global economic growth. The G7 member countries are the United States, Britain, France, Japan, Germany, Italy, and Canada. The first six countries were the original members of the G6. Its first summit was held at Rambouillet, France, in 1975. At that time it was the G6. Canada joined in 1976, making it the G7. In 1997, Russia joined, making it the G8. Other important global leaders are invited, including representatives of the European Union, China, India, Mexico, and Brazil. The leaders of important international organizations are also invited, including the IMF, World Bank, and United Nations. Canada hosted the 2018 Summit at La Malbaie, Quebec, on June 10-11. President Trump antagonized the other members by refusing to sign the final joint statement. He objected to any mention of "the rules-based international order." Members were upset about the trade war Trump initiated when he imposed tariffs on steel and aluminum. Trump also wants the EU to spend more on its own defense. Italy hosted the 2017 Summit at Taormina on May 26-27. President Trump agreed to back a pledge against protectionism. He refused to endorse the Paris climate change accord. Members agreed to further sanction Russia if it intervened again in Ukraine. President Issoufou of Niger reminded leaders of the need for further economic development in Africa to stop the flow of migrants. He also asked for intervention to end the crisis in Libya. It is the transit point for migrants heading to Europe. Japan hosted the 2016 Summit at Ise-Shima on May 26-28, 2016. 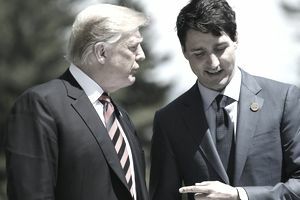 The leaders promised to support free trade agreements, including the Transatlantic Trade and Investment Partnership and the Trans-Pacific Partnership. They agreed to improve infrastructure within their own and other countries. The group established a new cyber-terrorism working group to enhance cooperation. It promised to help stabilize the Middle East to reduce the flow of refugees into Europe. The leaders promised to fight global warming by entering in force the Paris Agreement. Russia's President Vladimir Putin was supposed to host the G8 in Sochi on June 14-15. Instead, the G7 canceled the meeting. emergency summit in Brussels, Netherlands, on June 7-8. It continued economic sanctions against Russia and gave $5 billion in aid to Ukraine. It pledged to provide national emission reduction plans. It unveiled its plan to reduce emissions from existing power plants by 30 percent by 2030 compared to 2005 levels. It committed further support to the World Health Organization's efforts to reduce infectious diseases like Ebola and Tuberculosis. Hold a conference to reach a political solution to the Syrian conflict. The G8 tried to overcome Russia's resistance to intervening in Syria, its ally. Work together to find tax evaders. Support the Transatlantic Trade and Investment Partnership. Negotiations begin following the Summit. Support the EU/Japan and the EU/Canada trade agreements. Stamp out ransom payments to terrorists. Almost $70 million has been paid to free hostages during the past three years, at an average $2.5 million per captive. Ensuring the safety of the world's energy supply, support alternative sources, and reduce climate pollutants, such as methane, black carbon, and hydrofluorocarbons. Improve food security in Africa with the New Alliance, which will lift 50 million people out of poverty over the next decade. Contribute $16 billion annually through 2017 to address Afghanistan’s debt. Support Arab countries in transition with the Deauville Partnership. The 2011 Summit was hosted by French President Nicolas Sarkozy at Deauville, France on May 26-27. They responded to the Arab Spring uprisings by creating the Deauville Partnership to promote political and economic reform in these countries. According to the European Commission on the G8 France 2012, they created the first-ever declaration on human rights, democracy, and sustainable development for Africa. In response to Japan's nuclear disaster, the leaders agreed to stress test their nuclear plants and review international safety standards. Controversial Prime Minister Silvio Berlusconi hosted the July 8-10 Summit in L'Aquila, Italy. The primary focus of the conference was an agreement to continue the ongoing efforts to contain the global financial crisis. This conference included many members of the G20, who had not seen the same level of economic destruction. Members also agreed to a host of wide-ranging topics. These included efforts to reduce climate change, recommit to supporting African countries, spend $20 billion over the next three years to boost farming in rural areas, condemn Iran's nuclear program, support a reduction of nuclear arms in the United States and Russia, and support the two-state solution for Israel and Palestine. This critical conference was held in Tokyo, Japan from July 7-9 2008. Hosted by Prime Minister Yasuo Fukuda, the leaders still promoted optimistic views about the global economy while it crumbled around them. In fact, they were more concerned about inflation, a result of record-high oil, gas and food prices. They also held hopes that the WTO Doha Round of negotiations would be successful. The leaders stated a goal of 50% reduction of global emissions by 2050, to reverse global warming. Like the other summits, leaders supported the reduction of poverty in Africa and expressed concern over hot spots like North Korea, Iran, Afghanistan, and Israel, as well as Sudan, Myanmar, and Zimbabwe. In 2008, a subtle shift of power occurred. While the G8 talked about food inflation and all kinds of other admittedly important world issues, they completely missed the 2008 global financial crisis. As a result, it signaled the end of the old world order and the beginning of a new one. The meeting was held in July, while Fannie and Freddie were going bankrupt. It was after bank-lending Libor rates went haywire. It also occurred after the Fed held its first emergency meeting in 30 years to rescue investment bank, Bear Stearns. In other words, there were plenty of clues that these world leaders needed to do something fast. Instead, the G-20 stepped in at their summit and addressed the root of the problem. They requested the United States to regulate its financial markets more. The United States refused, allowing unregulated credit default swaps and other derivatives to plunge the world into financial crisis and recession. After that, it became apparent that the G20's emerging market countries, which had largely escaped the crisis, were necessary partners of any global initiative. And the G20 Summit superseded the G8 as the world's most important meeting of all global leaders. Unfortunately, the G-8 missed a critical opportunity to avert the 2008 global economic recession. They refused to agree to a code of conduct for hedge funds, which are located primarily in the United States and the United Kingdom. They recognized it was needed but didn't have the political will to follow through. Instead, Chancellor Merkel agreed to meet with these hedge funds to convince them of the wisdom in establishing a self-regulating code of conduct. As we now know, her efforts were not enough to reduce the global risks that unregulated hedge funds created. In 2007, German Chancellor and then-EU President Angela Merkel was Chair of the G8 Summit. She brokered a historic climate change agreement that included getting the United States to agree that its climate change policy is under the auspices of the U.N. Until then, the United States resisted subjugating its actions to U.N. policy. Merkel got the United States to agree to “seriously consider” cutting greenhouse gas emission in half by 2050. Chancellor Merkel’s leadership on this issue seemed to indicate that the EU was becoming more of a global leader than the United States. This would have represented a significant change from the post-WWII Marshall Plan era. Sadly, the summits mean very little to you. That's because the summits are a missed opportunity for the leaders of the world's developed countries to accomplish something and solve serious global problems. Instead, they issue general proclamations.